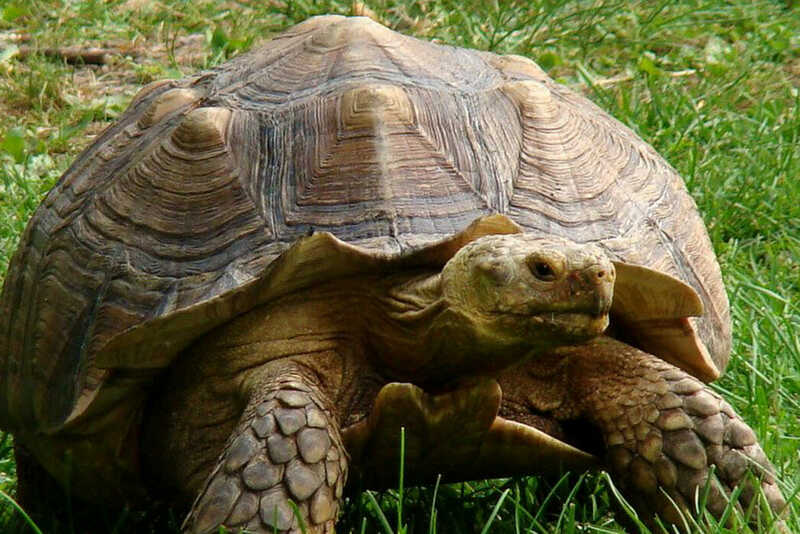 In 2005, a Detroit Zoo keeper discovered a tortoise walking down the 10 Mile Road service drive outside of the Zoo. The tortoise was taken in and named Tubby. He was estimated to be 3 to 5 years old at the time, and was about the size of a dinner plate; now he is the size of a large buffet plate! Tubby can be seen in the African Watering Hole in the warm-weather months. African spurred tortoises are well camouflaged by their overall sandy coloration. They have thick golden to yellow-brown skin and brownish carapaces. The broad, oval carapaces displays prominent serrations at the front and back margins and noticeable growth rings on each scute, which become marked with age. Large overlapping scales cover the front surface of the forelimbs, while the hind surface of the thigh bears two or three large conical spurs, from which they earn their name. African spurred tortoises are the largest tortoise of the African mainland.